U.S.A U.S.A U.S.A. *slow music* (From the parking lot, Team Fresh Kicks approaches whilst listening to Bruce Springsteen). 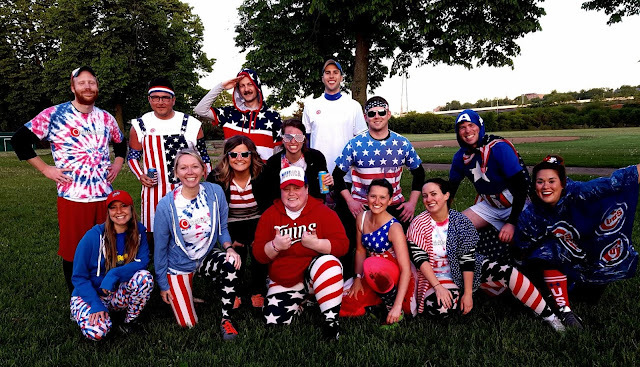 With nothing but red, white and blue on, Fresh Kicks came prepared to kick ball and flip cups. However, the kicking of balls came up short. As we continue to not keep the ball down when kicking, it continues to haunt us in the Win-Loss column. Fantastic pitching by Kris was not followed up by the defense behind him (Cory). With our third straight loss in the field, Team USA was not discouraged as they know the real talent shows up at that bar. As rookie Chelsea quickly learned that making the flip cup team was no joke, she tried to flip, danced and will be back to make the final five soon. Speaking of the final five, we can't forget about our fearless leader from afar Angie flying in to make a celebrity appearance for Fresh Kicks. Her on base percentage remained 1.000% and her flip cup percentage has suffered since the move to Maine. As Megan, Amy, Ben, Cory and Angie made the final five after king of the hill, it was evident that Angie had lost a step since her move to the east coast. Instead of her casual one flips, Angie was two and sometimes three flipping. It didn't matter though, because when the pressure was on and Don't Touch Our Balls approached the table the final five were locked in. Game one showed gave Fresh Kicks their first loss, but their composure was not affected. They knew they were the better team and they proved it as they rattled off three straight wins to take home the win in flip cup for another week. As the chants of U.S.A faded in the distance, the regulars at the Pint tipped their caps as Fresh Kicks of Ball Air walked away slowly with other flip cup win.